Participant registration for the 1st Okinawa Karate International Tournament, which will be held starting August 1, 2018, began on November 1. Including both the competitions and seminars, the tournament is aiming for between 5,000 and 6,000 participants. 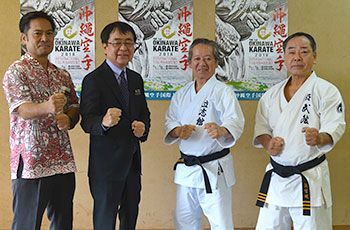 The same day, representatives from Okinawa Prefecture and the Okinawa Dento Karatedo Shinkokai, who will co-host the tournament, put out the call to, “gather at the birthplace of Karate,” at a press conference. Participants must register on the tournament’s homepage: http://okinawa-karate.okinawa. The deadline for registration for Okinawan residents is January 31, 2018; for those outside of Okinawa, the deadline is March 31, 2018. If the executive committee decides that online registration is too difficult, they may decide to also allow mail-in and in-person registration as well. Qualification for those inside Okinawa will be March 23-24, for outside of Okinawa qualification is August 2-3. On August 6 and 7, there will be seminars teaching traditional Karate technique. Seminars are open to everyone, not just people participating in the competition. Seminars are limited to 50 people each, and participants must apply and pay the 3,000 yen registration fee. Choko Kiyuna, president of the Okinawa Dento Karatedo Shinkokai, said, “Our peace-loving ancestors developed Karate.